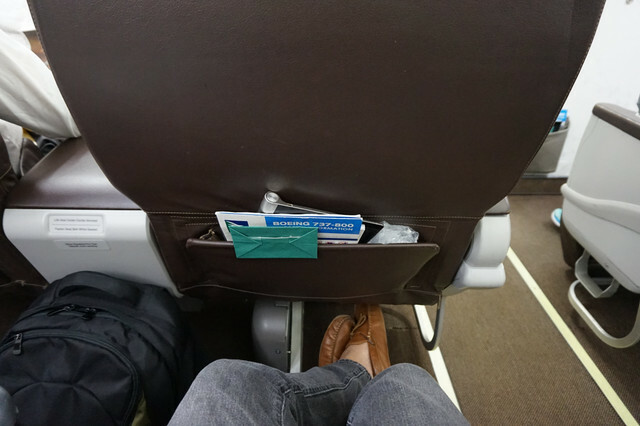 My first ever experience flying in a premium cabin with Silkair. 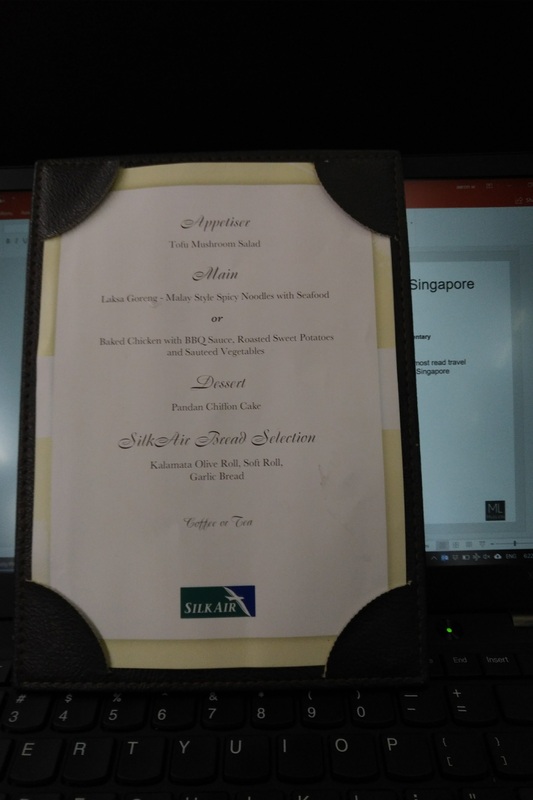 I was really looking forward to this flight, not necessarily from a comfort point of view but more for novelty as it would be my first time trying Silkair’s business class product. 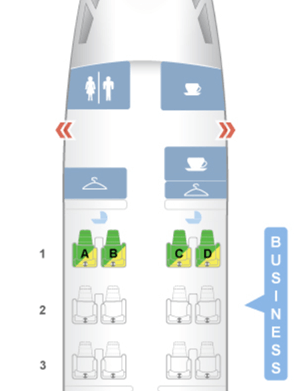 Narrow body premium cabins are rarely anything to get excited about (unless, perhaps, you’re on one of Qatar’s A320s…), but I guess I was kind of hoping to see SQ-lite, or what SQ service would look like if they operated narrow body jets. 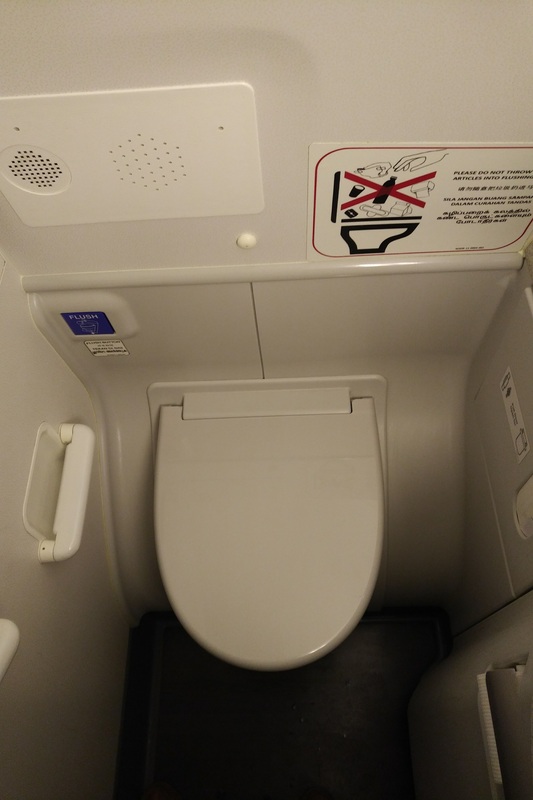 Today’s flight was operated by a 737-800 that was configured 2-2 (what else) in business class. 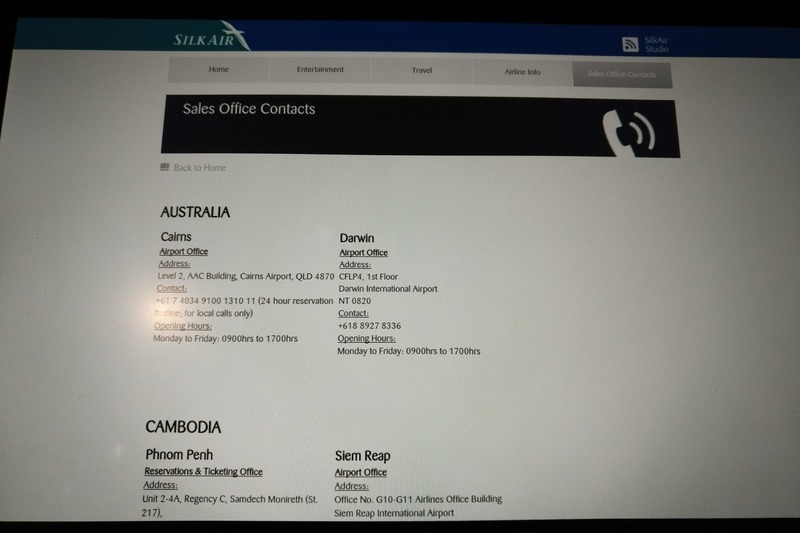 Although Silkair’s new 737 MAX 8 looks really nifty, that aircraft wouldn’t be deployed on a 3 hour route like Hanoi. 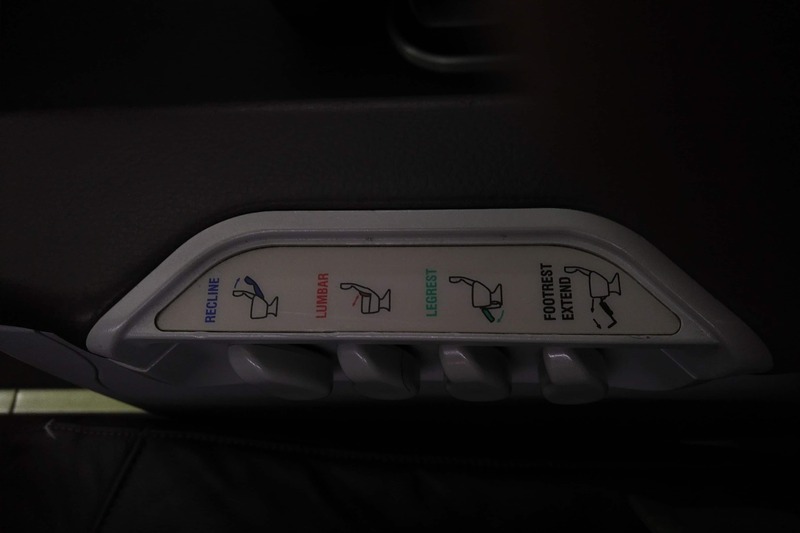 That’s a shame because the business class on that plane looks marginally more comfortable. 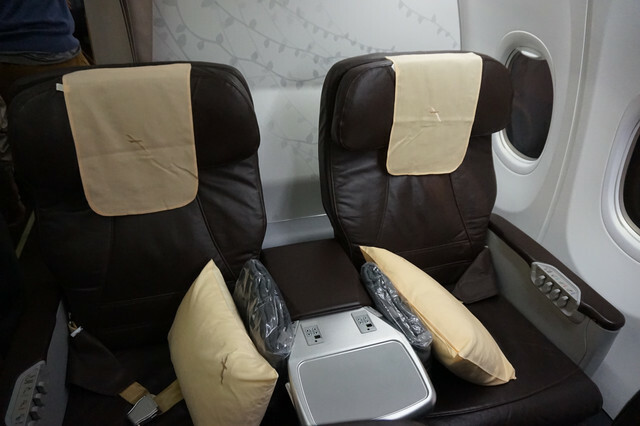 On this older 737 you still had recliner seats, but older, more worn versions. 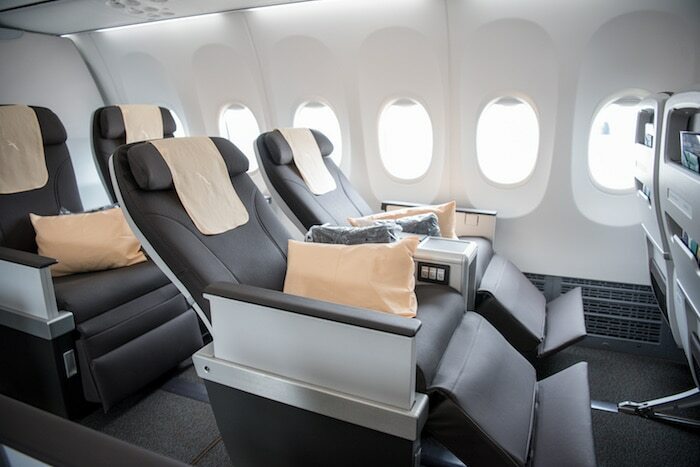 This is more akin to what you’d find in domestic first class in the States, with a wide armrest in between the seats and manual recline. There was not as much legroom as I was expecting but it was still more than adequate. 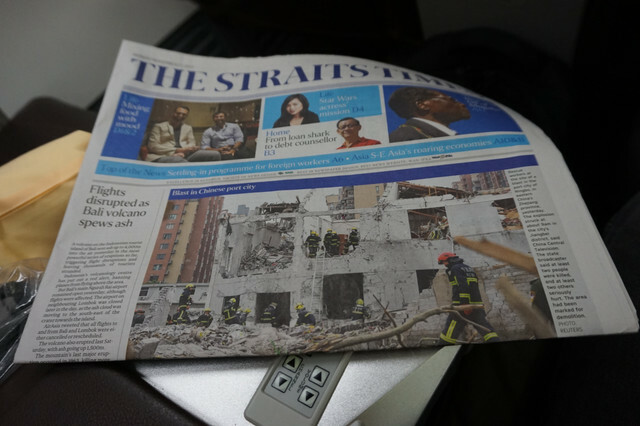 The cabin crew chief came around to introduce herself to each passenger in business class, following which her colleague distributed newspapers. 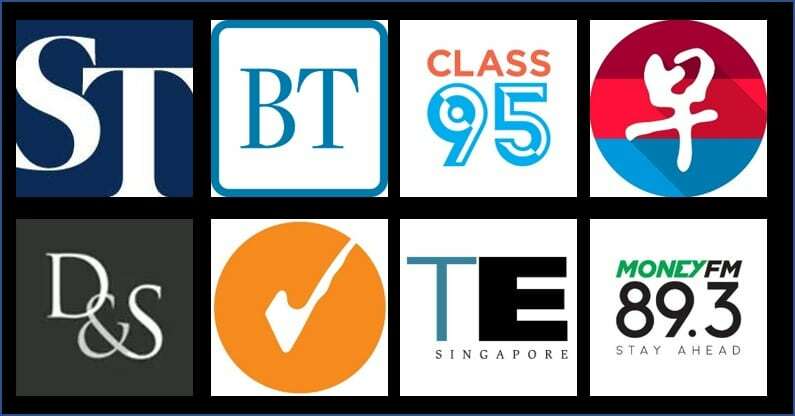 I chose the Straits Times, because who wouldn’t want to read a newspaper which awesomely won 15 out of 18 journalism awards at SPH’s annual awards ceremony. 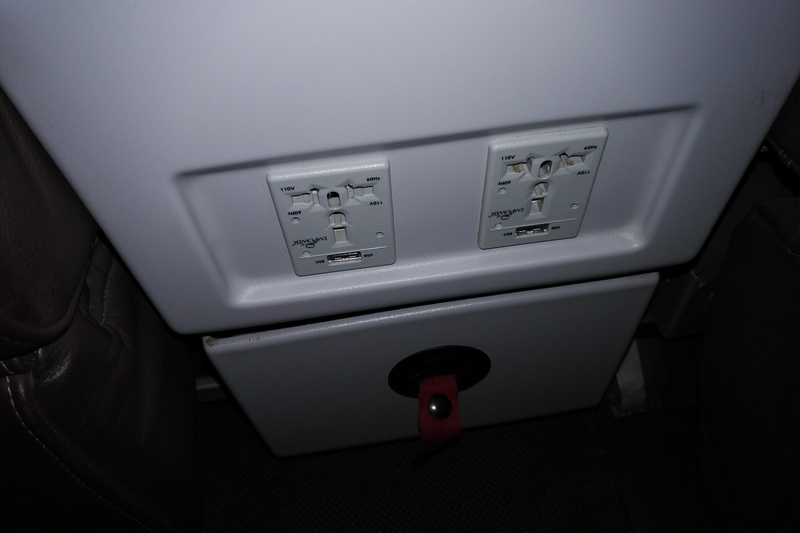 Although the seats are on the old side, each one still has in-seat power with a USB outlet. 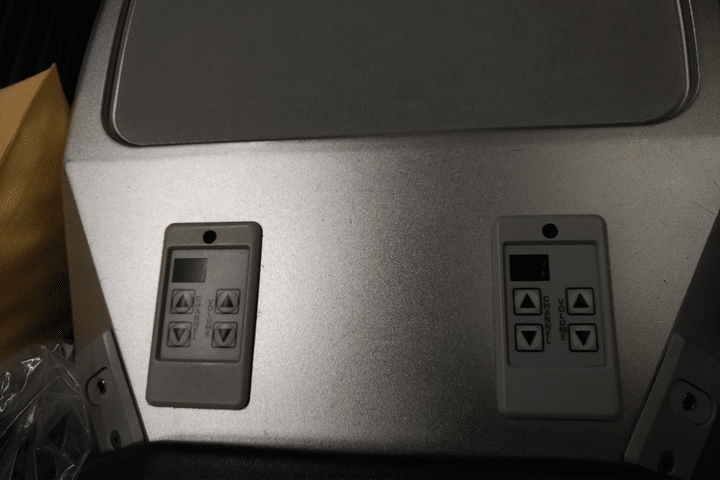 As did the seat controls. Unlike those you find in the vintage Ultimo seats, these are completely manual and really require that you put your back into it. As well as a pair of headphones. 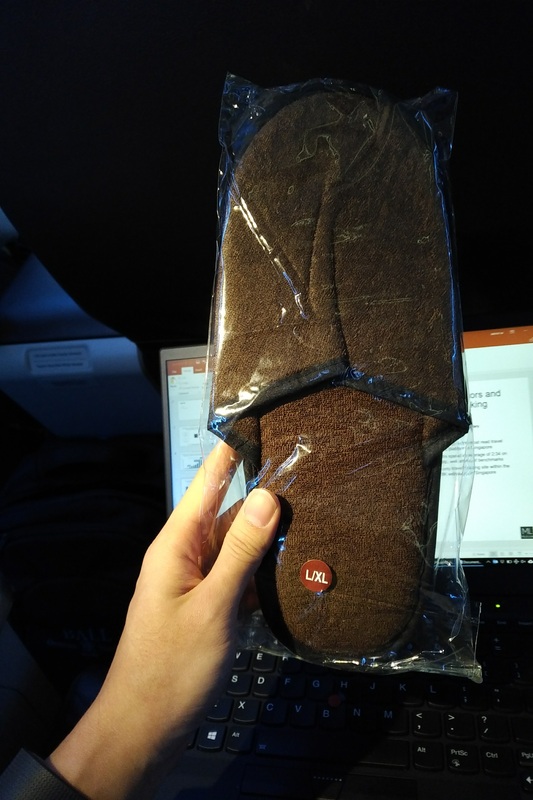 Regrettably, Silkair doesn’t have proper headphones in business class but instead the same cheap single-use type that SQ distributes in economy. 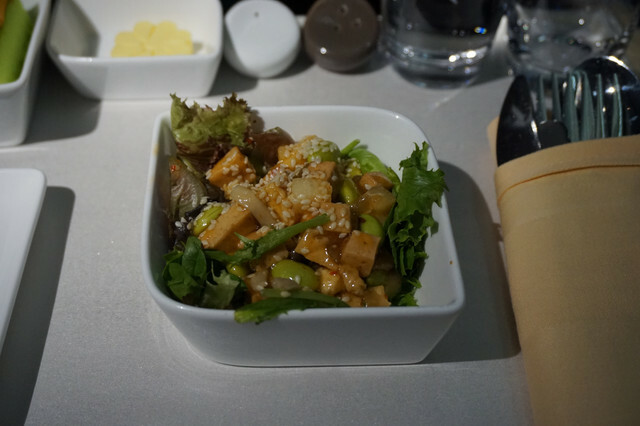 A few quick points about the crew: some of the SQ service DNA has definitely rubbed off on the Silkair crew. 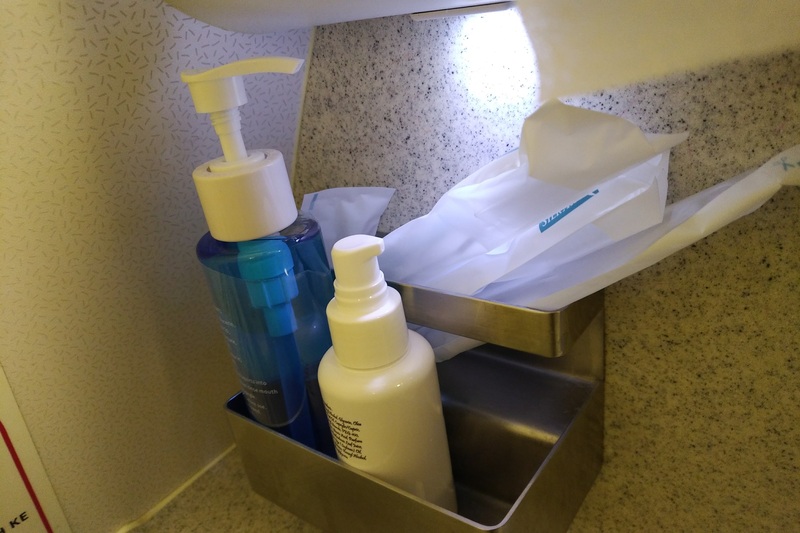 You can see it through small things like addressing all passengers in business class by name or removing plastic wrap from your seat as soon as they see you unwrapping something. 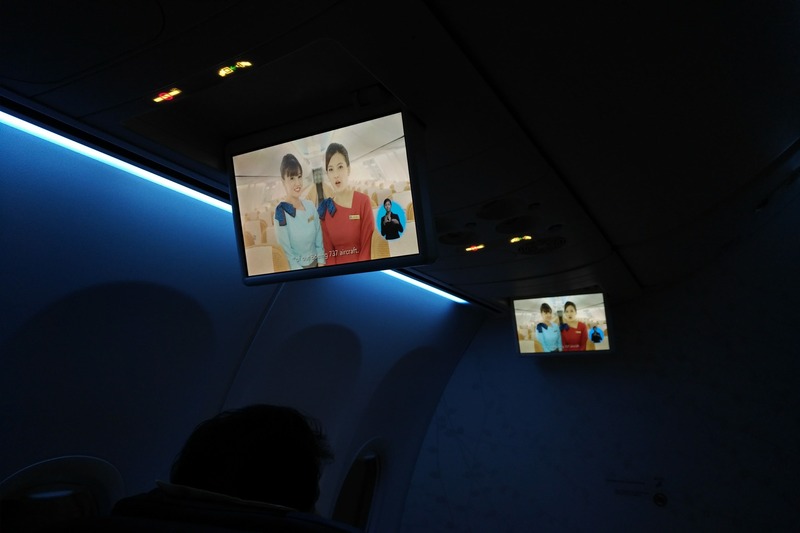 IFE screens dropped from the ceiling to play Silkair’s safety video. 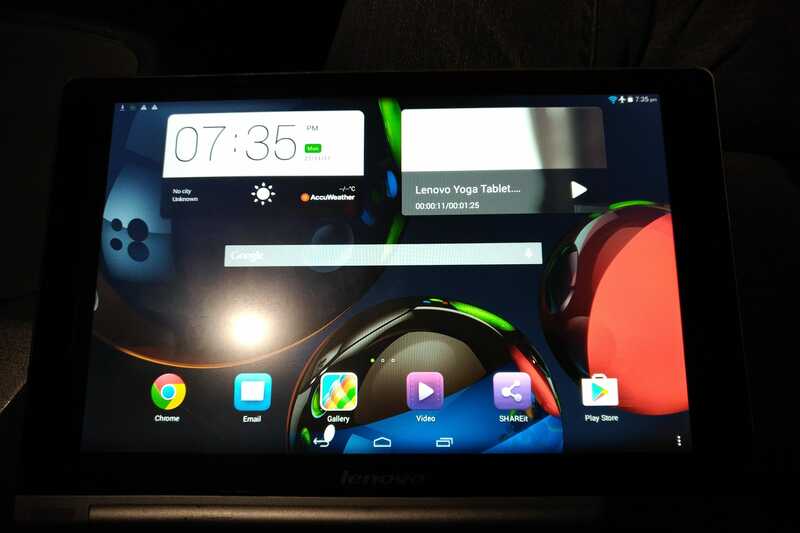 It’s not as posh as SQ’s new and improved version, but it gets the job done. 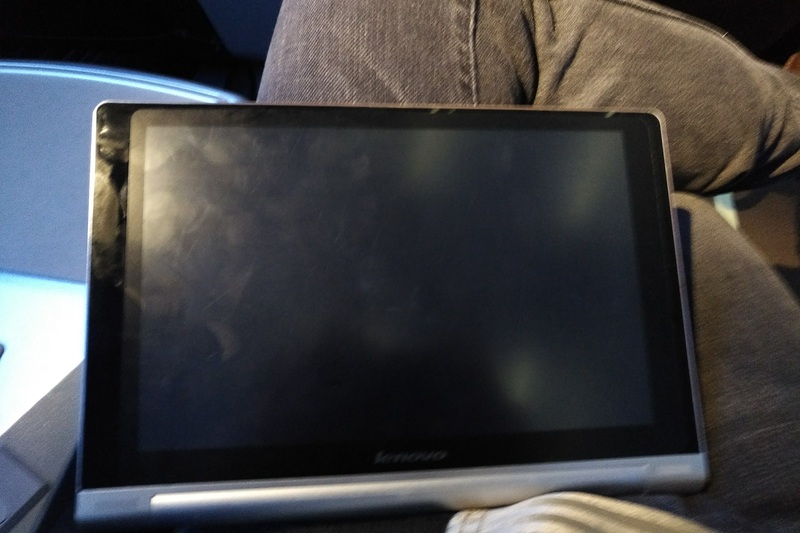 While the video played, I amused myself with the Lenovo Yoga tablet that each business class passenger had in the seat pocket. 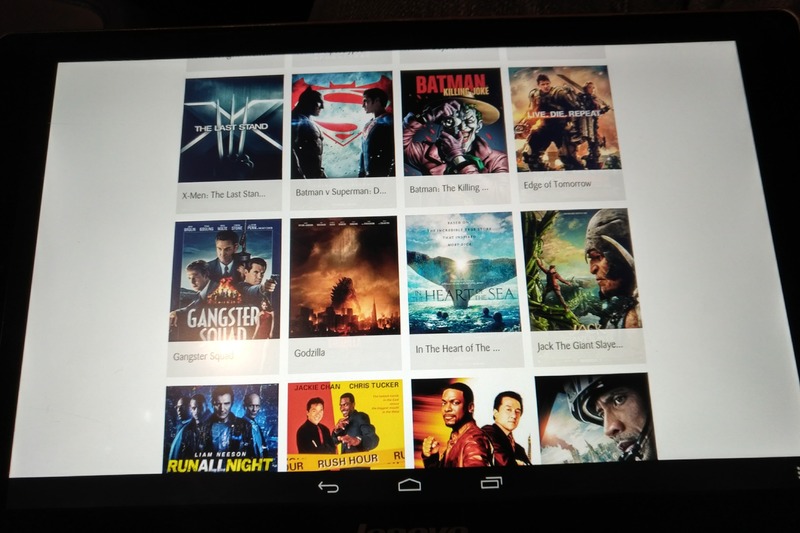 This is meant to be your entertainment hub with movies, TV shows and music. 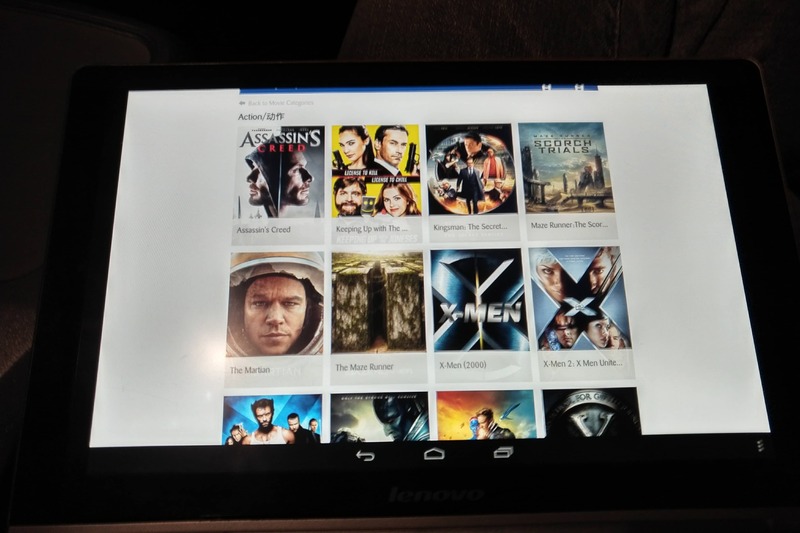 The movies aren’t saved on the tablet’s HDD- instead they are streamed to the tablet via the aircraft’s WiFi network. 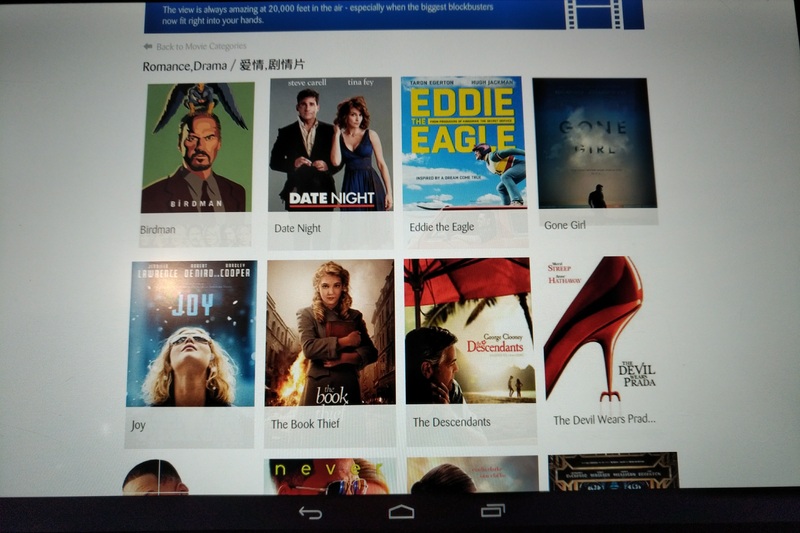 If you’re in economy class, you’re still able to access the same entertainment via an app on your phone. 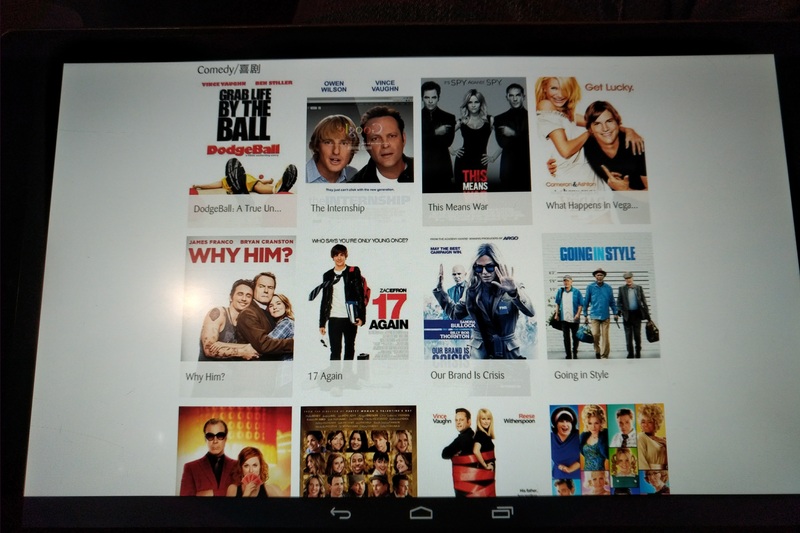 Note that despite the fact that movies are streamed to your computer, you won’t be able to surf the net. 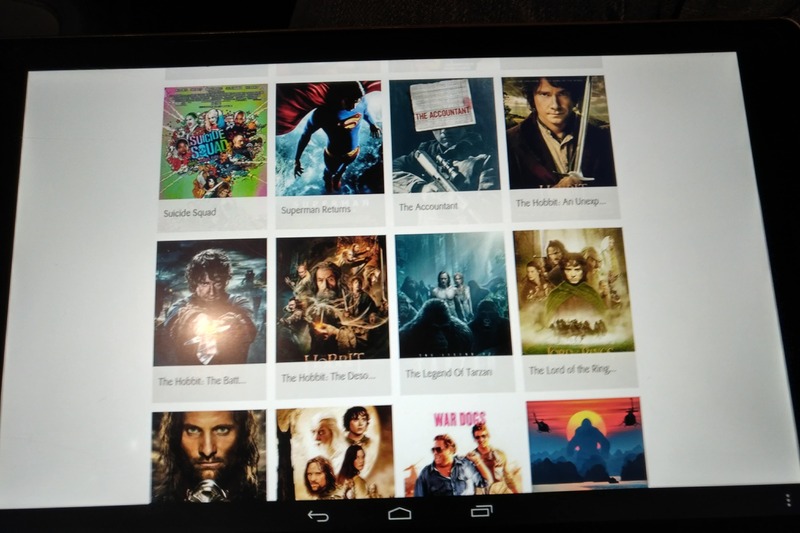 There were a lot of movies. And I really mean a lot. 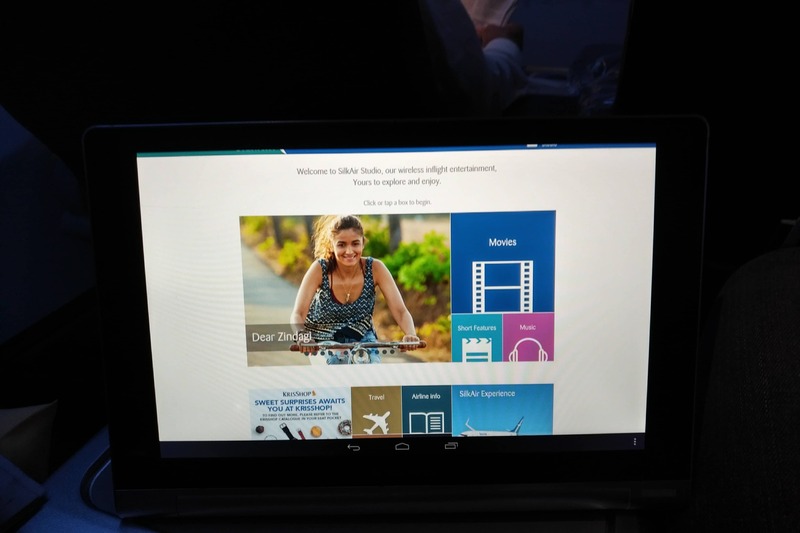 There’s a tab with airline info that leans more corporate press release than actually useful. 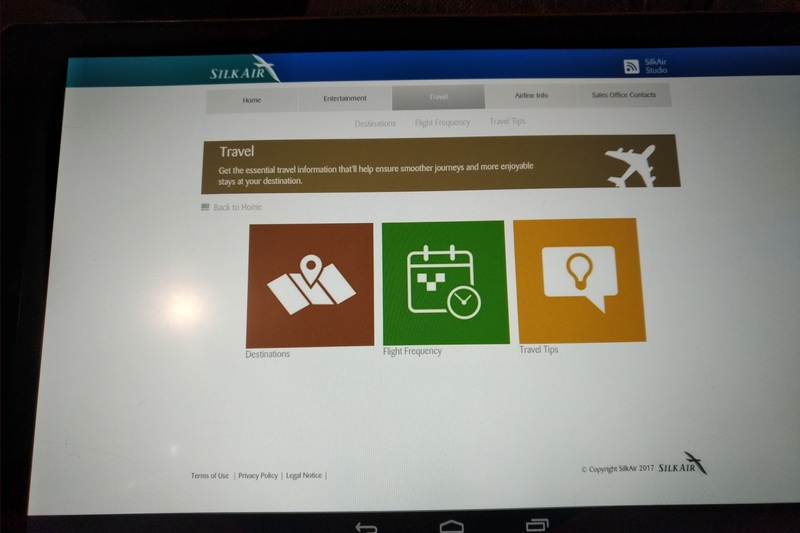 I was hoping the travel section might have one of those learn a language apps or some documentaries, but instead just listed Silkair’s route map, timetable and some listicle of trite travel tips. 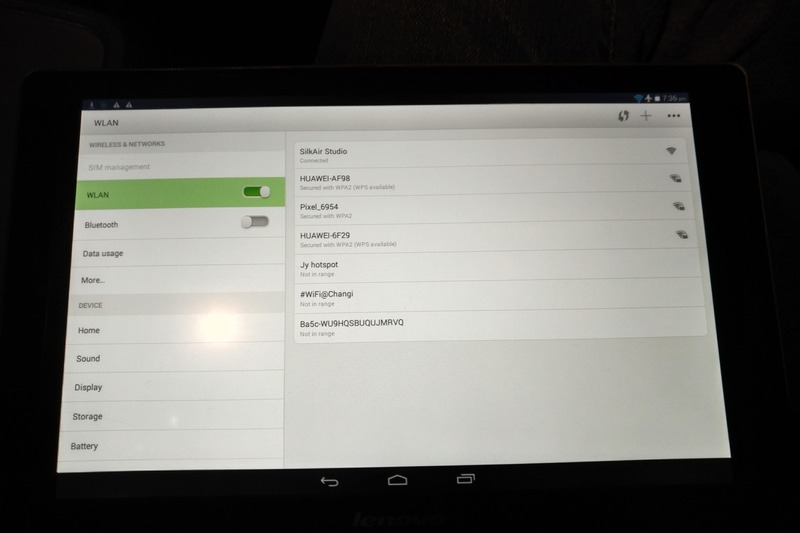 Interestingly enough, the Silkair app doesn’t appear to lock down tablet functionality. I was still able to exit to the home screen as per normal. If I were so inclined, I could even go into the settings and fiddle around. You’d think they’d want to stop that from happening. Before takeoff the crew had come around with a menu to take passenger orders. 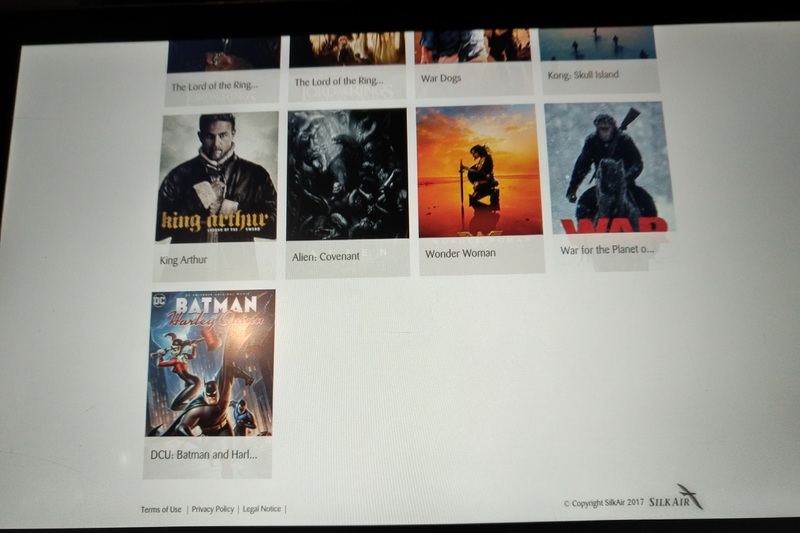 Note that I say “a menu” and not “menus”, because it’s literally one menu that the whole cabin shares. It’s really more of a nicety than anything else because there’s only one decision to be made- your choice of main. Takeoff was uneventful and after the seatbelt sign went off the crew came around to fulfill drink orders taken before takeoff. 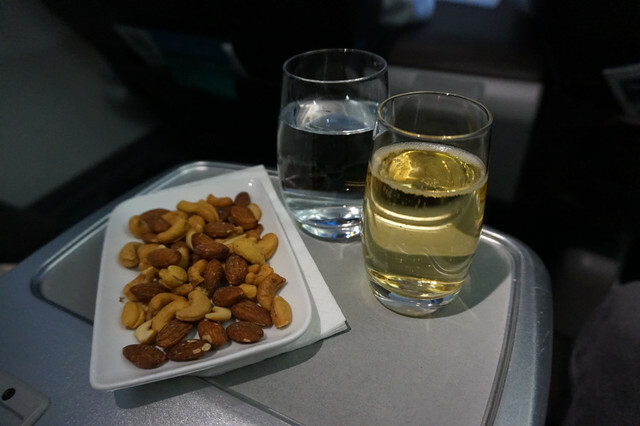 Silkair does serve champagne FYI, but it does not serve warmed nuts (the horror). My table was set with a very simple tablecloth and a tray was brought with the starter. The main was probably one of the more interesting laksas I’ve ever had. A dry laksa, which seemed to be more like mee goreng. A hipster might call it “deconstructed laksa”. 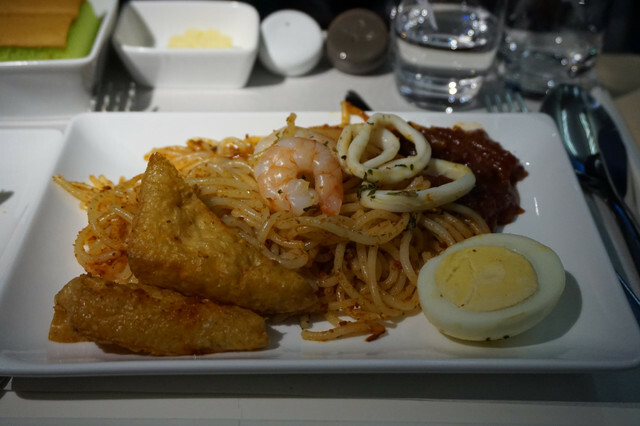 It tasted fine, if not more akin to an economy class meal plated on business plates. 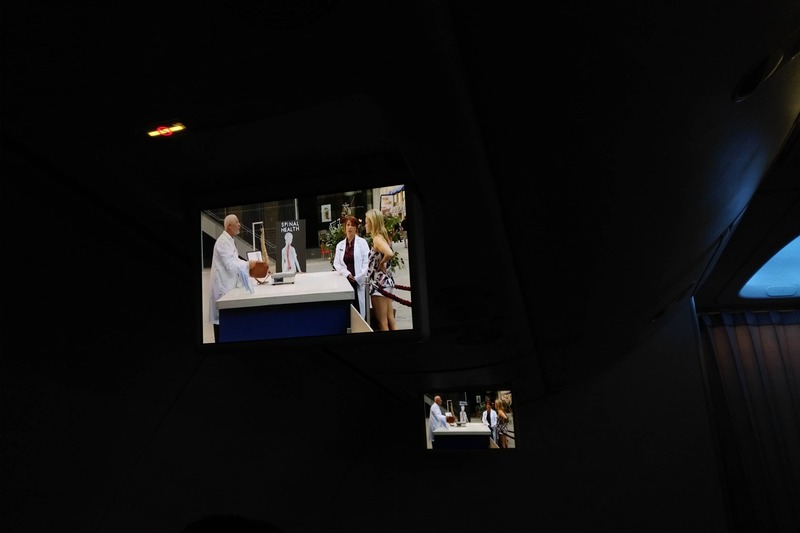 Mid-way through the flight the IFE screens dropped from the ceiling again to play one of those silent “Just for Laughs” gag TV shows. Really, anyone who finds these amusing needs to be chemically castrated. Speaking of chemically castrated, here’s the loo. 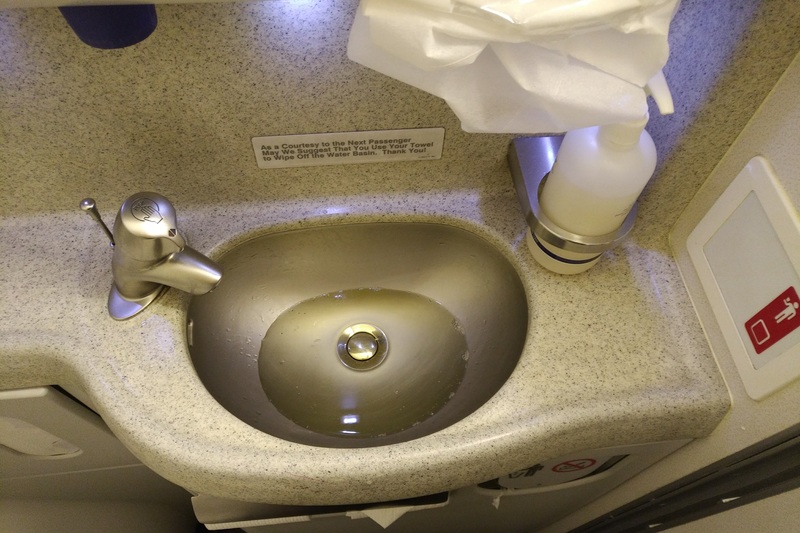 There were a few Silkair branded toothbrushes, no fancy toiletries and a sink that wouldn’t quite drain properly. 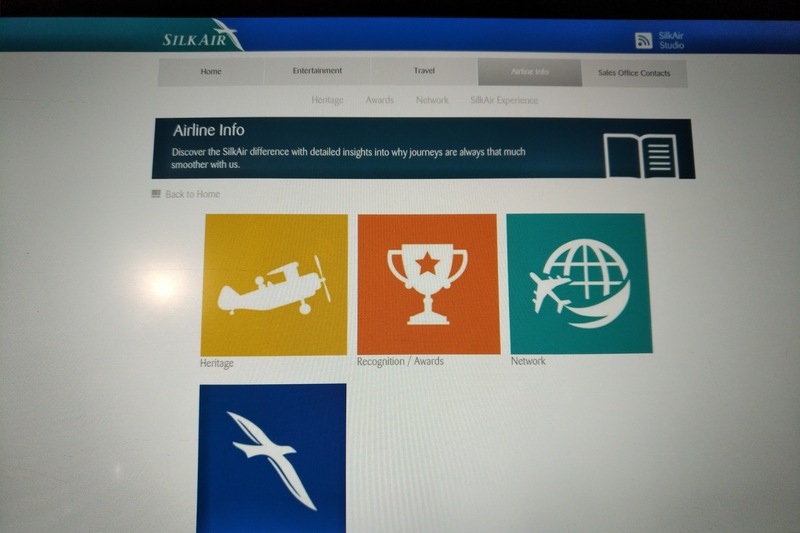 Silkair may be SQ’s little sister but it’d be unfair to call it the ugly one. 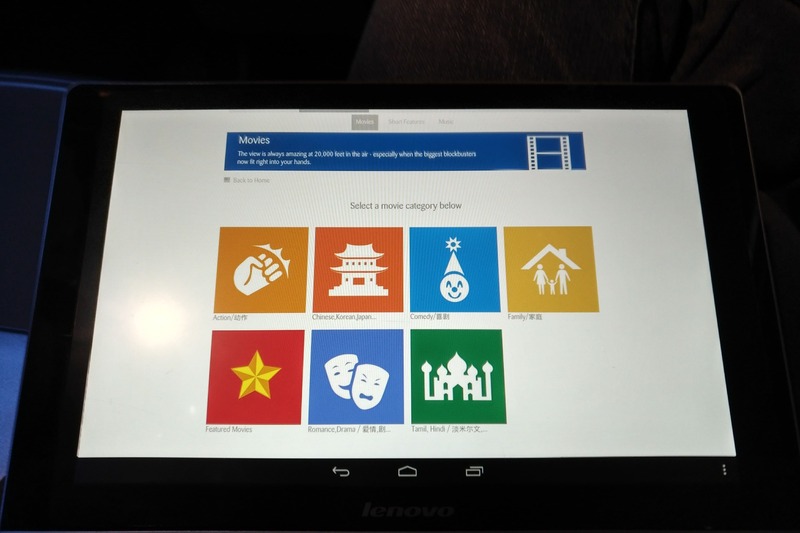 The service was probably just as good as any I had on SQ, The IFE was more than sufficient and the seat is adequate enough for a regional flight. 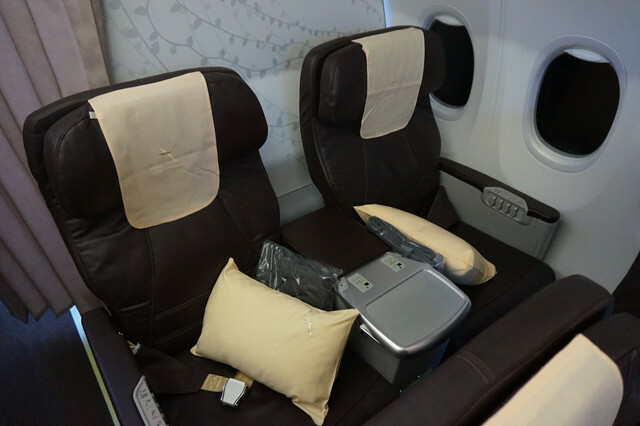 I still don’t think regional business class, much less regional narrow body business class is worth redeeming for no matter what some crackpots say, but if you’re based outside of Singapore and combining Silkair into a long/medium haul SQ itinerary hopefully this gives you an idea of what to expect. Thanks Aaron, the food looks appetising at least. How did you manage to eat with the ST next to you? The smell coming from it must have been pretty bad…I use that newspaper to wrap fish I buy at the wet market. Service might be bearable in J but they are often appalling in Y. I find silk air’s Y staff generally emotionless and cold very unlike SQ or even sometimes Scoot.